Los Angeles Unified school administrators said Friday that three sessions with a state mediator have failed to break an impasse over a new labor contract for the district's teachers union. The 30,000 members of United Teachers Los Angeles have already given their union leadership the power to call what would be the first teachers strike in LAUSD since 1989 — a work stoppage that would leave 480,000 students in limbo. But the union and the district must complete one last stage of negotiation before teachers can legally walk off the job: fact-finding. Both LAUSD and UTLA have been rehashing many of the same arguments over their contract positions since the two sides began talking in January 2017. A mediator doesn't formally rule which sides' arguments are better — a mediator is solely focused on trying to find a way to get the two sides to agree. That's not the case in fact-finding. In fact-finding, a neutral arbiter comes in, looks at evidence and issues a ruling — of sorts — on who's right and who's wrong. The term "fact-finding" itself "is kind of a misnomer," said Tim Yeung, an attorney at the firm Sloan Sakai who's practiced public sector labor law for more than 20 years. Fact-finders, he said, "are not just after the facts ... they actually make recommendations" about which side's bargaining positions to adopt. The fact-finder's recommendations are non-binding — either side could choose to ignore them. But sometimes, Yeung said the fact-finder's report can force one side or the other to make the concession that breaks the stalemate. Fact-finding takes around six weeks, on average, Yeung said. On the short end, the process takes only a few weeks, he said, but the process can stretch on as long as two months. HOW DOES THE FACT-FINDING PROCESS WORK? Fact-finding is organized around a three-person "fact-finding panel" — a state-appointed "chairperson," one representative appointed by UTLA and another representative chosen by LAUSD. How the panel goes about its work often depends on the fact-finders' preferences. Some fact-finding proceedings are organized around "quasi-judicial" proceedings, Yeung said, where the two sides present witnesses, evidences and closing arguments. Other panels operate more informally. The chairperson's really in charge of the proceedings, Yeung explained: "The idea is that the neutral [chairperson] can have these two people in a room, bounce ideas off of them ... A lot of times the fact-finder is trying to find a resolution — to get the parties to settle." WHAT HAPPENS AT THE END OF FACT-FINDING? In the end, the fact-finder issues a recommendation for how to settle the contract dispute. At that point, a lot of things can happen: the two sides could go back to the bargaining table or meet again with mediators. State law says they could even go to binding arbitration. But it's at the end of fact-finding that both the union and the district can legally go for their respective nuclear options: LAUSD could unilaterally put their "last, best and final" contract offer into effect and UTLA leadership could legally call a strike. THIS SOUNDS PRETTY GRIM — THE BRINK OF A STRIKE? IS THERE NO MORE HOPE IN THIS WORLD? If you've been looking for a reason to be optimistic about this rhetorically-heated LAUSD-UTLA drama, Yeung has one for you. UTLA and LAUSD did meet for more than one session with the mediator, which Yeung called a "good sign." He said in some negotiations the employer and union meet once with a mediator and immediately request the help of a fact-finder. Multiple mediation sessions indicates to Yeung "they [were] making some progress." "Until they get through fact-finding," Yeung said in an interview Friday morning, "there's always hope." 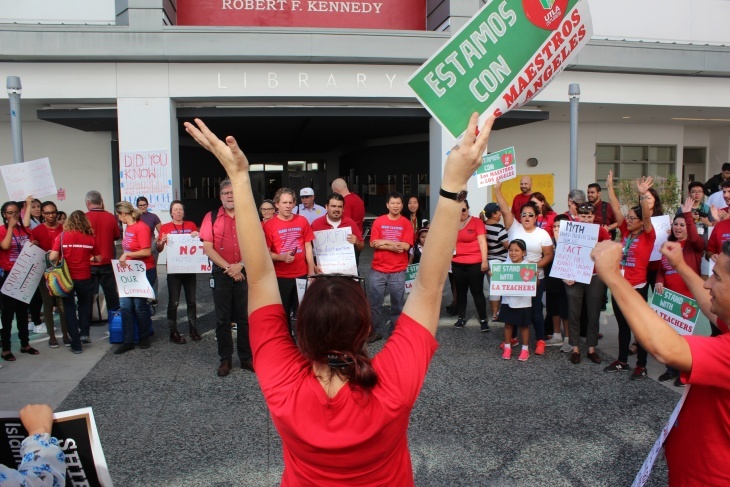 But on Friday afternoon, district officials issued a statement announcing they had lodged a formal complaint against UTLA "for refusal to participate in good faith" in the mediation. "After just one mediation session," LAUSD's top lawyer David Holmquist said, "UTLA was seeking to have the mediation process terminated and was openly inciting conflict. UTLA insisted that mediation was futile after one mediation session." In September, before mediation began, LAUSD Superintendent Austin Beutner had said he was "open-minded, but not optimistic" that mediation could resolve the district's dispute with UTLA.